Janatha Vimukthi Peramuna’s Propaganda Secretary Vijitha Herath’s recent comments (in an English Daily) on his party’s stance on the national/ethnic question makes interesting reading; especially in the context of the current constitution making process. Herath spoke on the need for further discussion on how modifications or amendments could be brought about without leaving room for separation and that his party had taken a flexible approach to these issues. 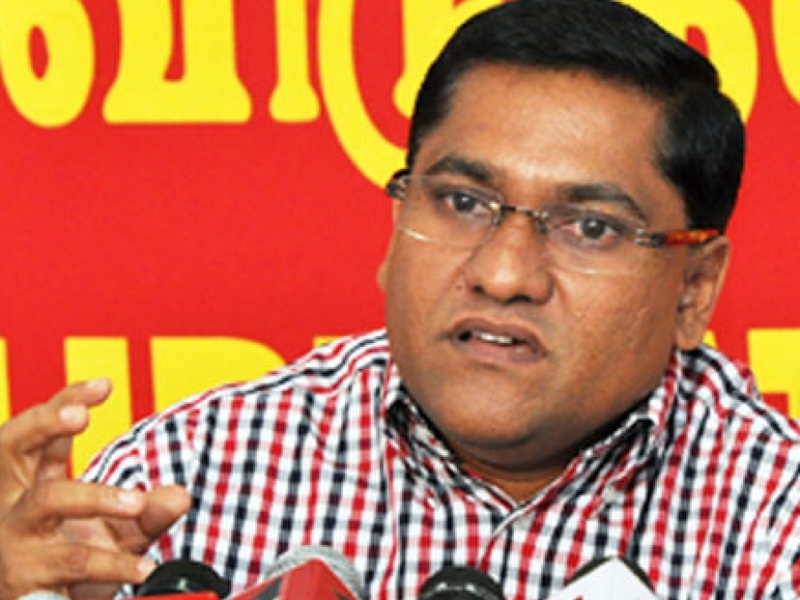 When reminded about the JVP’s stance that the Provincial Councils system is a stepping stone to separation, Herath said there is a need for change in the thinking to suit the times, and as a party, the JVP has embraced change. Herath’s comments makes one wonder whether his views herald any fundamental shift in the JVP’s political stance regarding the national question and how to resolve it. Herath speaks about the necessity for change in thinking after the war and how the party has embraced that new thinking, but he didn’t mention anything about what the JVP as a political force has done towards effecting any attitudinal change among the people in the South. Especially with regard to a political settlement that would address at least the minimum of the legitimate aspirations of the minorities. More than a half-century of Sri Lanka’s political history shows the JVP’s stance on the ethnic question has always run counter to the political aspirations of the Tamil speaking people. Despite claims to being Marxist – Leninist, the party that staged two armed insurrections during the latter half of the last century, never seemed to have a progressive policy on the political problems of the minorities. Political historians had recorded that the fifth political indoctrination class for its members at the end of the 1960s was a diatribe against the Tamils, in particular, Tamil plantation workers of Indian origin, who were portrayed as pawns of Indian expansionists. It is also a well-known fact that there were no recognized Tamils among its leaders nor did any action take place in any Tamil areas during the 1971 JVP insurrection. The JVP has never supported any of the attempts made by previous governments to find a political solution to the ethnic problem. The JVP was not in existence when the Banda-Chelva Pact was signed in 1957. But the founder leader of the party, Rohana Wijeweera, participated in the protest march in Colombo organized by the Sri Lanka Freedom Party (SLFP) and mainstream left parties against the Dudley – Chelva Pact in 1966, disregarding a decision taken by the Peking wing of the Ceylon Communist Party not to participate in that vociferous communal campaign. Wijeweera was a prominent leader of the Youth League of the Peking wing of the Communist Party led by N. Shanmugathasan who happened to be a Tamil from the North and was one of few national level politicians of Sri Lankan Tamil origin. The JVP led an insurrection to overthrow the United Front government of Prime Minister Srimavo Bandaranaike and her Left allies in April 1971. It was crushed mercilessly and the leaders were arrested, tried before courts and sentenced to long years of imprisonment, with Wijeweera getting a life sentence. In 1977, the UNP government under the leadership of J. R. Jayewardene, released the JVPers from jail, after which the party entered mainstream politics and functions as a Democratic Party for few years, eschewing communal politics. During the 1982 presidential election, Wijeweera visited Jaffna to canvass Tamil votes and came out in support of the Tamil demand. However, all this changed after July 1983 when the Jayewardene government, in a bid to deflect attention from the government, blamed three left parties – the Communist Part of Sri Lanka (CPSL), the Nava Sama Samaja Party (NSSP) and the JVP – for the communal violence and proscribed them. The proscription of the CPSL was removed within months and that of the NSSP after a year. But the proscription of the JVP remained. It was during this period that the JVP returned to its former communalist mind set. Emerging as the most racist of Sinhala parties, it made full use of the chauvinism that had been roused in Sri Lanka by the government and the mass media as a reaction to the armed struggle of the Tamil militants. It’s said the JVP provided the ideological leadership to the anti-Tamil chauvinist movement, which was at the same time anti-UNP. Despite the fact that it was the JVP that staged the first armed rebellion against the State in independent Sri Lanka, the party’s hatred of the armed struggle of the Tamil militants appeared almost paranoid. Progressive political observers at that time described the JVP as a movement of the most backward, parochial and xenophobic sections of the majority community. They wished to deal with the Tamils and their struggle in an even more uncivilized manner than the then UNP government. It should be noted that the JVP, even in its democratic phase, never supported any attempt by the governments to solve the national problem. When the Jayewardene government introduced the District Councils system in the early part of the 1980s, the JVP vehemently opposed it and campaigned against it among the people in the South. When the Indo-Sri Lanka Peace Accord was signed between Indian Prime Minister Rajiv Gandhi and President Jayewardene in July 1987, the JVP, through an underground operation, plunged the country into a bloodbath and intensified its campaign against so-called Indian expansionism, and ordered the people to boycott Indian goods, warning of dire consequences if the warning was ignored. The JVP also rejected the Provincial Councils system introduced by way of the 13th Amendment to the constitution in the wake of the Peace Accord, describing it as a step towards the separation of the country. At that stage, JVP’s campaign against the so-called Indian expansionism was at its peak. They targeted politicians who supported the peace accord and the Provincial Councils. Prominent among those who were killed was Vijaya Kumaratunga, the actor turned politician husband of Chandrika Bandaranaike Kumaratunga who later became the first woman Executive President of the country. During the first year of President Ranasinghe Premadasa’s rule, the second armed rebellion of the JVP was crushed and Southern Sri Lanka witnessed the most ruthless state repression. 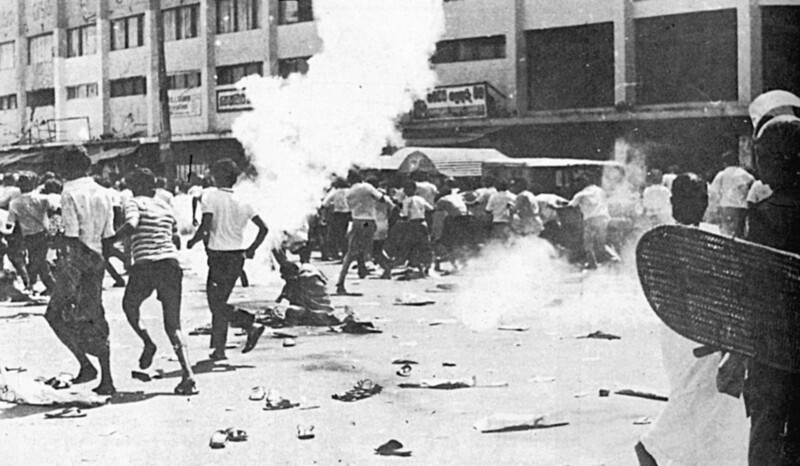 Thousands of youth were mercilessly killed, many of them burned on tyres on the roadside in broad daylight. Wijeweera and his close associates were captured and later killed. Subsequently, after almost five years of political hibernation JVP returned to democratic politics in 1994. During Chandrika’s period, the party contested all the elections including the Provincial Councils. It was in the forefront of the communal agitation in the South against the Norwegian facilitated peace process. The propaganda and protests directed against the peace process roused unprecedentedly strong sentiments against any attempt to find a political settlement to the ethnic problem among the people of the South. The party also went to the extent of forming a political alliance with the government led by Chandrika Kumaratunga, where leading members of the party accepted ministerial portfolios. Later the party left the government protesting the negotiations initiated to device a mechanism for the rehabilitation and resettlement of those affected by the 2004 tsunami in the North and East, with the participation of the Liberation Tigers of Tamil Eelam (LTTE). In the 2005 Presidential election, the JVP supported Mahinda Rajapaksa who contested on an anti-peace process platform. Though the party played no part in the government of Rajapaksa, it wholeheartedly supported the full-scale war waged by him. After a short-lived union with Rajapaksa, the JVP joined forces with the movement fighting the misrule of Rajapaksa and his brothers, and subsequently went on to support the candidates of the common opposition in two consequent presidential elections in 2010 and 2015. The JVP lent critical support to the National Unity Government led by President Maithripala Sirisena and Prime Minister Ranil Wickremesinghe in the initial stage and later unhappy with the government’s policies and activities began to strongly criticize it. However, it has continued to participate and cooperate in the constitutional making progress. The brief political history of the JVP drives home, what the writer sees, as the glaring aspect of the inherent nature of a party that has never supported any attempt to find a political solution to the national problem and has never identified itself with the progressive political forces that were supportive of the legitimate political aspirations of the minorities. Instead, the JVP has always been inclined to identify itself with all the campaigns directed against attempts to find an amicable settlement. 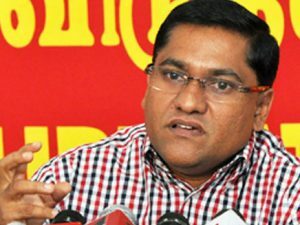 If the claim by Herath that his party has changed its thinking and is going in the right direction under the new leadership is to hold water, it has to demonstrate it by deviating from the ‘traditional ‘ beaten track, and show positive actions so as to contribute constructively to the resolving the national problem.